Here you can find a range of Slings by Invacare for Hoists and Stand Aids. that can be used for routine home, healthcare and institutional tasks. 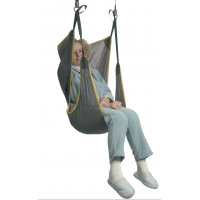 Our range includes Slings for Toileting, Walking Rehabilitation and Patient Transfers. Dress Toilet Sling - PolyesterThe Invacare Dress Toilet Sling is suitable for users with limited mob.. Dress Toilet Sling (High) - PolyesterThe Invacare Dress Toilet Sling is suitable for users with limi..
Easy Fit Sling - PolyesterThe Invacare Easy Fit Sling supports the whole body and the users hea.. Comfort Sling - NetThe Invacare Comfort Sling Net is designed to support the whole body and suitable.. Comfort Sling - SpacerThe Invacare Comfort Sling Spacer is designed to support the whole body and su.. Stand Assist Sling - PolyesterThe Invacare Stand Assist Sling is primarily designed for use wit.. Transfer Stand Assist Sling - PolyesterThe Invacare Transfer Stand Assist Sling is compatible w..
Universal Standard Sling - PolyesterInvacare Universal Standard Sling Polyester - Small Supports the..